The combination of good graphics; great sound and intense action makes for a very immersive game that will be hard to put down. 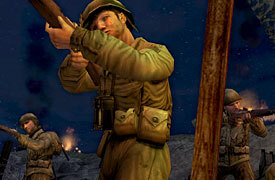 Call of Duty 2: Big Red One is the latest console iteration from Activision's growing World War 2 empire. This chapter follows a squad in the US army's 1st infantry division; Also known as the “Big Red One” due to the large red one embroidered on the left shoulder of the 1st I.D. 's uniform. For this title Activision paired up developers Gray Matter Studios and Treyarch. Gray Matter's experience with the Call of Duty franchise through their development of the PC's CoD: United Offensive expansion pack and Treyarch's depth of experience developing console games combined to form a strong and diverse development team. As can be expected from a game developed for an aging console approaching the end of its life cycle, CoD2: BRO offers no major improvement in graphics. That is not to say that the graphics are bad -they are actually quite good- only that there is nothing groundbreaking happening here visually. The character models look good by PS2 standards and the environments look great. Just like the rest of the titles in the CoD franchise, the sound available here is very well done. Hooking your PS2 up to a home theater is strongly recommended. The immersion provided by a big screen TV and full surround sound is unbeatable. Adding to the realism is quality voice acting provided by none other than the actors from Band of Brothers. Considering their presence at the side of the main character throughout the game and the frequency with which they speak, the high quality is a blessing. So it looks good and sounds great, but how does it play? The first level places the character in a battle late in the war before starting back at the beginning for the second level. The pace ramps up fairly quickly and becomes quite intense fairly quickly. There are a variety of missions that boil down to the average attack, defend, or just plain survive missions we have all played before... a lot. Where Big Red One shines however is in the implementation. The devil is in the details as they say and this game is devilishly good. 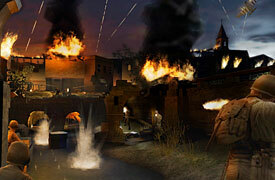 The game manages to balance intensity with a manageable difficulty level. The player will often be surrounded by huge firefights that add a sense of urgency and impression of impossibility to every goal that needs to be completed, yet they are all doable. The balance of appearing difficult while remaining achievable has long been a staple of the CoD franchise and remains unchanged in this game. The multiplayer available is online only and playable in Deathmatch, Team Deathmatch and Capture the Flag modes. The multiplayer also supports voice chat through a USB headset. It would've been nice to have local multiplayer games available against bots like in Killzone. Even nicer would have been to also have the split-screen multiplayer options such as the VS and coop modes also found in Killzone. Although we have all fought our way through WWII countless times by now, it may just be worth playing through again. In this title Activision provides what is arguably the best WWII shooter available for the PS2, and what may also be the best shooter of any kind for the PS2. The combination of good graphics, great sound and intense action makes for a very immersive game that will be hard to put down.